Hummus is a very simple dish, but it’s not easy to perfect. Here, chef Alon Shaya shares the secret behind his amazing recipe. Hummus is a very simple dish, but it’s not easy to perfect, says Alon Shaya. The Israeli-born, Philadelphia-raised chef made three gallons of it almost every day for two months to land on the amazing recipe at his New Orleans restaurant Shaya. Of the utmost importance, he explains, is soaking and simmering the chickpeas with baking soda (to help loosen the skins) and letting them cook until very, very tender to ensure a puree with the creamiest texture. 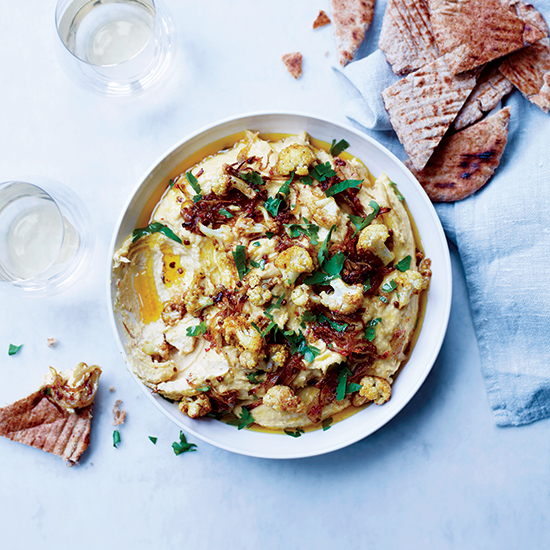 He tops his most popular hummus preparation (the menu always includes four variations) with curried cauliflower and caramelized onions. It’s a nod to the fried cauliflower with mint found at cafés across Israel. Shaya, 4213 Magazine St., New Orleans; shayarestaurant.com; 504-891-4213. Get Alon Shaya’s amazing hummus recipe here.